Demolition of a bridge, built before the 405 Freeway, is at the heart of Carmageddon, but did you know that we'll experience a sequel next summer? Brace yourself for Carmageddon 2. The Mulholland Bridge has been there longer than the freeway it crosses. It was built in 1959. They snuck the 405 underneath it a year later. Today, the bridge's posts are not wide enough to add lanes. The company that is tearing the bridge down is actually the same company that built the bridge to begin with. On Friday, workers from The Kiewit Company, along with Metro and LAPD workers, walked the construction zone to work out last minute logistics. The timeline for Carmageddon weekend is precise. "They're working on 15-minute increments throughout the 53-hour period to get the work done," said Dave Sotero, of LA County MTA. Then workers will know exactly where they need to be in the demolition process. "It's not a Vegas-style demolition. It's a slow, arduous process of chipping away parts of the decking," said Sotero. That's because they have to leave the north half of the bridge up, lengthwise. The other side won't come down until next year. Prepare for Carmageddon 2, because every summer blockbuster has to have a sequel. 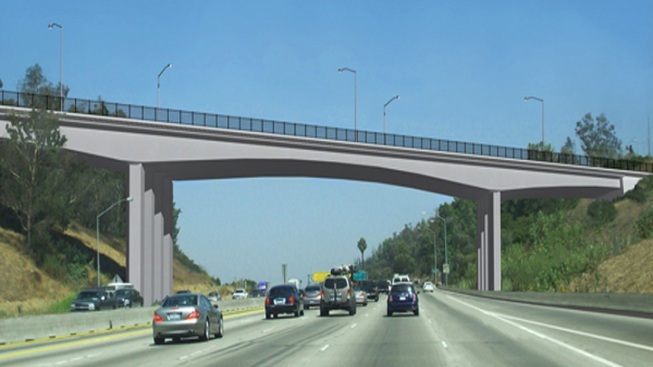 "Eleven months from now, we will have another 53-hour closure to do the exact same thing to that side," said Sotero. "Oh wow. It's going to be really bad," said Lonnie Mejia, who works at a Mobil in the area. "I had no idea. I thought it was going to be that weekend and that's it."